The upcoming Nokia 9 PureView has been leaked again and it is said to include an in-display fingerprint sensor, a Snapdragon 845, and a 5-lens rear camera array housed in a chassis with bezels reminiscent of the LG G6 or Pixel 2 XL. A press render was leaked by well-known tipster @evleaks and the specs along with a marketing video come courtesy of MySmartPrice. This is our second look at renders and the third time we’ve seen the camera setup. In addition to bringing a 2018 processor and 2017 bezels into the 2019 market (the device is expected to launch before the end of January), the phone is expected to pack 6GB RAM and a 5.99-inch 18:9 2K display with HDR10 compliance. While MySmartPrice didn’t specify the exact pixel resolution, a 2K display with an 18:9 ratio should translate to 2880×1440 pixels. For the curious, HDR10 refers to a video standard (HDR stands for “High Dynamic Range“) that features a wide color gamut (it shows a broader range of colors than non-HDR displays). According to the leaks, there will be no notch, so the overall look of the front facade is somewhat similar to the Nokia 8 Sirocco, but with rounded corners. The in-display fingerprint sensor is teased in the leaked marketing video shown below, but it is unclear whether it will be an optical sensor like the OnePlus 6T or an ultrasonic one as expected in the upcoming Samsung Galaxy S10. The penta-lens camera array may look ridiculous to many, but it is expected to capture 10 times as much light as an “ordinary” phone camera sensor and users should be able to use Google Photos to make depth-of-field adjustments after taking a shot. Like most cameras on Nokia phones, the Nokia 9 PureView will feature Zeiss-branded optics. 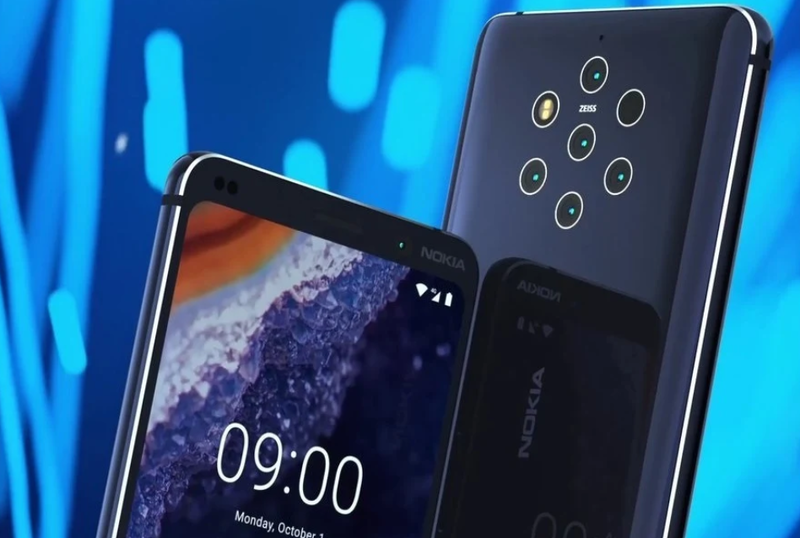 The Nokia 9 PureView will run the Android One flavor of Android Pie, which means the phone should receive at least two years’ worth of timely updates along with the usual security updates.